The cost of wind and solar energy will continue to fall rapidly between now and 2050, but will remain more expensive than gas unless a global carbon price is imposed. That’s according to BP’s inaugural Technology Outlook which considers how technology upgrades will affect the planet’s energy supply. The oil and gas giant said that solar PV generation in North America in 2050 will cost around $107/MWh, with onshore wind at $71/MWh. New gas generation costs will stay steady between 2015 and 2050 at $59/MWh. The expected importance of a carbon price is given extra relevance this week, after the United Nations’ climate chief Christiana Figueres said that a price on carbon was unlikely to be established at COP21 in Paris. Figueres added that the world was moving towards that kind of market mechanism in the future. Around 40 nations and 23 cities, states and regions have implemented or are planning for a price on carbon with programs and mechanisms covering about 12% of global greenhouse gas emissions. The number of implemented or scheduled carbon pricing instruments has nearly doubled since 2012, reaching an aggregate market value of about $50 billion. Recent proponents of the mechanism include Angela Merkel and Francois Hollande, several major oil and gas companies and the food conglomerate Mars. 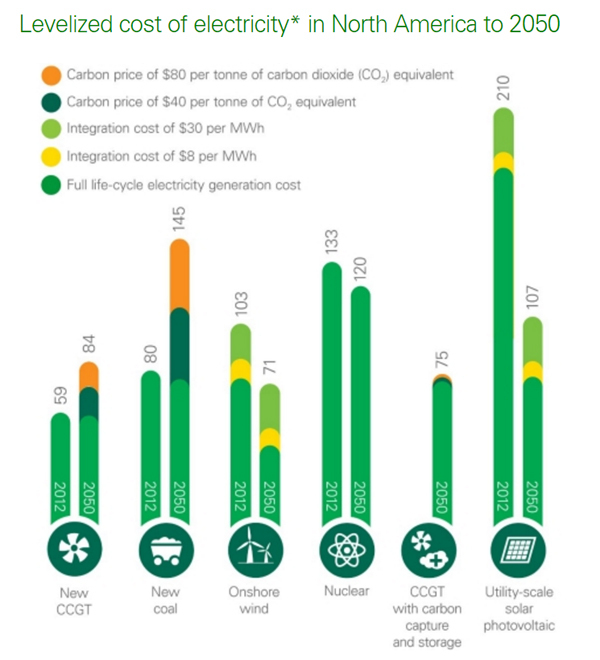 The BP Technology Outlook added that the power sector – which accounts for 38% of world primary energy demand – offers greater scope than the transport sector for reducing carbon emissions, thanks to the continued development of wind and solar.